A mixture of rustic-transitional and industrial styles grants the California House Loft Shuffleboard a casual appearance that enhances any recreational game room’s restful atmosphere. In addition to gifting the table an overall pleasant presence, rafter-like legs and cross frames offer sturdy support for the cradle, protecting it and the playfield from harm. 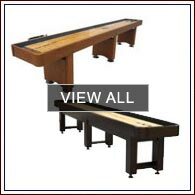 There are many ways which differentiate the Loft from other shuffleboards, one of which being the playing field’s composition. In contrast to the industry-standard maple, California House utilizes American beech wood. Though the change may seem insignificant, it actually plays an integral role in longevity and durability, only enhanced by the top-quality polymer resin coating that enhances play in addition to preventing the wooden surface yellowing over time. Rather than using stickers or paint to mark the letters and numbering onto the playfield, they are inlaid, a detail which serves as a testament to the care which goes into the shuffleboard’s construction. 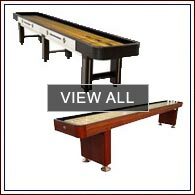 While it may take an experienced eye and some degree of knowledge to appreciate the factors which go into the playing surface’s singular creation, no one can question the individuality expressed through each table’s customizable features. A hallmark of the California House aesthetic, the alleys, alley walls, alley floors, and collars are made from your chosen fabrics or leathers. Wood finishes also give you a lot of freedom, coming in a staggering 27 distinct variations. This level of personalization is practically unprecedented, and never comes without praise. To fit the desired dimensions of any game room, the Loft Shuffleboard Table is available in 9-foot, 12-foot, 14-foot, 16-foot, and 18-foot sizes, all of which are proudly made in the USA. Such a treasured investment must receive proper upkeep and inventory. 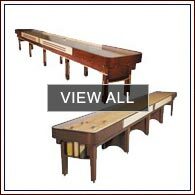 Our assortment of shuffleboard accessories include maintenance kits, table wax, weights, and covers, all of which will help preserve a pristine condition only improved through the passage of time.